Grand Lake Dock builds every dock with superior wind bracing that eliminates the water and wind damage. 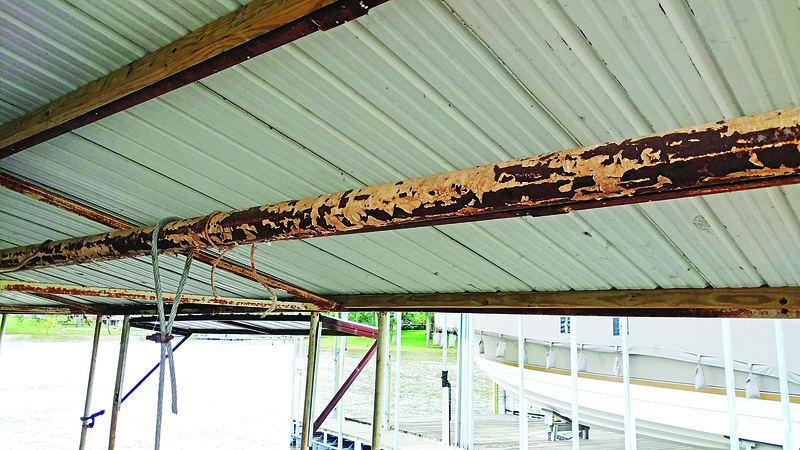 No matter what your location, our boat docks simply don't have water and wind damage like most others. 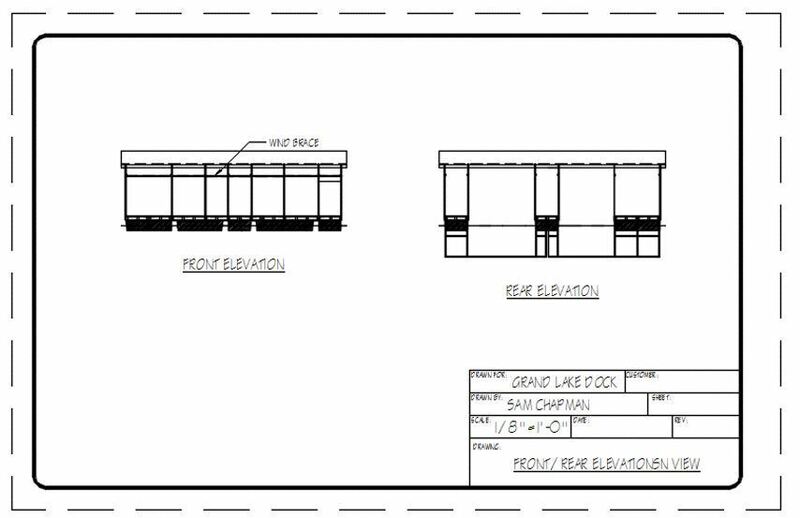 Grand Lake Dock's construction will rid you of maintenance problems and you'll get a better dock, too. Don't put up with paint peeling and flaking. Grand Lake Dock builds every dock of galvanized steel that never needs to be painted. Grand Lake Dock Is The Superior Dock Builder On Grand Lake. All columns are 3/16” steel 2” x 2” square tubing placed on 6 ft centers fastened with ½ inch, grade 8 bolts. Wind bracing is critical on Grand Lake, so we use 2 x 2 angle, 3/16 inch steel for all wind bracing. We use dock floats from Hendron Plastic with a 15-year maintenance warranty. Our float frames (underwater) holding the floats in place are made of stainless steel and cannot rust. All columns and purlins at or below water level are steel, hot-dipped in zinc, so they will never rust. Decking on our docks is made of hand-select, grade A lumber from Jones Hardware. All roofing is 40-year, 26-gauge steel available in a variety of colors, attached with color matched fasteners. 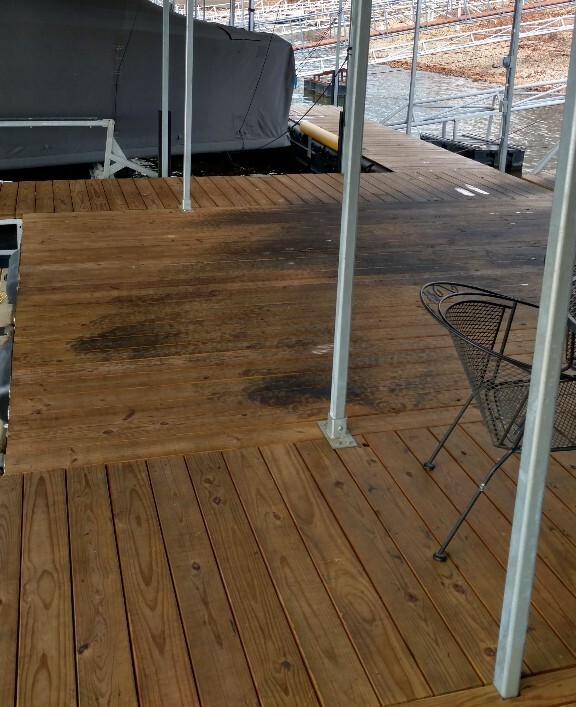 And for added assurance that your Grand Lake Dock will outlast any others and require much less maintenance . . .
. . . Every dock we build exceeds the requirements of GRDA’s code. Here’s an example: GRDA code states that all docks must float a minimum of 8 inches above the water. But we know Grand Lake’s weather, and that’s not enough for us. Our docks float 12 to 16 inches above the water preventing damage from any snow load that will push a dock down in the water and waves that will lap over an 8-inch clearance. Compare this with other docks minimally built only to meet the code requirements and float 8 inches above the water. All our docks are floated for greater stability because the Hendron Plastic floats we use are placed approximately 2 feet apart. Compare this with other docks that use fewer floats per square foot and are less stable causing maintenance problems where none should exist. Grand Lake Dock will install Sea Anchors, Winches, Boat Lifts and other additions on docks to fit your needs. Important construction elements used in Grand Lake Dock construction. We use only 3/16 and 1/4 inch steel for all construction. Our corners are made of 1/4 inch steel, fastened using 1/2 inch, grade 8 bolts, and will not bend.